There’s only one more event on the LTC calendar, the Capital Humane Society Holiday Run at Pioneers Park on December 2. Please come out and run, cheer, volunteer, or better yet, adopt a dog! Since my last column, the weather has contributed quite nicely to a highly successful Lincoln Mile on a new course, the newly renamed Nebraska Football Road Race, an evening of fun at the 2nd annual GSK Orange Run, the 42nd running of the Buffalo Run, and the Capital City Classic. Time flies, but good running weather helps put icing on the cake. 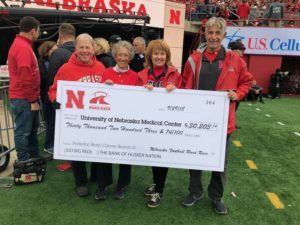 As does the culmination of the Nebraska Football Road Race did, with the ceremonial presentation at the Nebraska-Purdue football game of a check for more than $30,000 to the University of Nebraska Medical Center representing funds raised in conjunction with this race for pediatric brain cancer research and treatment. On a personal note, this check presentation triggered a current event that has given me a whole new perspective and appreciation of these kids or anyone who has undergone brain surgery. On July 30 I underwent a nine-plus-hour surgery to remove a considerably large benign brain tumor. Recovery is not complete, but I expect it to ultimately result in a full one, thanks to the spiritual and physical support of many, especially Nancy. Your LTC board has been hard at work examining its internal organizational structure through strategic planning and marketing efforts. This is a difficult process for an all-volunteer organization. Although the goal is to provide a positive impact within our organization for the long term, the intent is to improve the runner experience for everyone. We hope to share the outcome of these efforts as they come to fruition over the winter, so stay tuned. Speaking of volunteers, we need them—always—especially those who are dedicated and reliable. Their involvement enables the Lincoln Track Club to give back to the community in many ways. So, if you are not running an LTC event, please show your support by volunteering and bring friends and family too!